Stretching from the Grand Canyon to the White Mountains, Arizona is home to the largest continuous Ponderosa Pine stand on the continent. Within this stand hide dozens upon dozens of slot canyons chronicled in this blog. Weakened by drought, insects, climate change and well intentioned but perhaps misguided forest management, over 25 percent of Arizona’s Ponderosa Pines, including the aforementioned stand have been ravaged in the last decade from monster fires including the Rodeo-Chediski and last year’s Wallow Fire. The latter being the largest in state history burning over half a million acres. During a recent summer day, this desert dweller, escaped the heat into the iconic Ponderosa Pines for a solo descent of Casner Cabin Draw. With my only company being the towering trees I had plenty of time to think about McKinnon’s article which was published just the day before. To summarize, for tens of thousands of years the Ponderosa Pines could tolerate the dry conditions and regular fires that stayed low to the ground and prevented the forests from growing too dense. As settlers began arriving in large numbers in the mid 19th century their livestock began grazing the vegetation more aggressively than the native deer and elk, allowing the Ponderosas to fill the void and grow more densely. At the same time the settlers were also suppressing natural lightning fires which also prevent the forests from becoming too dense. This policy continued for generations. says Wally Covington, director of the Ecological Restoration Institute of Northern Arizona University, in McKinnon’s article. Before the settlers the forests contained 30 trees per acre while today’s fire protected forests contain up to 1,000 trees per acre. When these dense forests do burn it is so all-consuming and hot that the trees, soil and habitat may never recover. 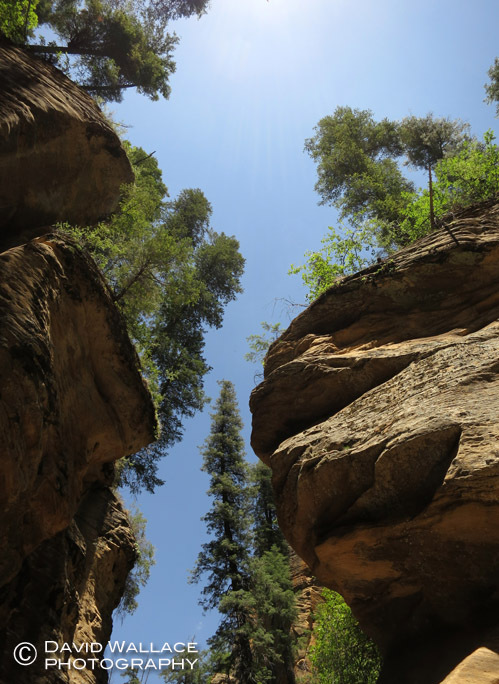 The United States Forest Service working with a private company as part of the White Mountain Stewardship Project have thinned sections of super dense Ponderosas in the Apache-Sitgreaves National Forest. According to the White Mountain Stewardship Project these areas did not burn as aggressively during the Wallow Fire and many of these trees survived. Every year the fires come. It is a nerve racking time. In part this is because I am often spending many days photographing these wildfires on assignment for the Arizona Republic, but it is also stressful because I find myself waiting to see what wilderness will be next. So far the forests that are home to many of the canyons we cherish have been spared. To read McKinnon’s story and other’s from his series on Arizona’s forests and wildfires click here. With Wyatt on his back, David hikes through a burned area of dense Ponderosa Pine in the White Mountains near the West Fork of the Black River in July 2012. Ponderosa pine trees seen from the bottom of the West Fork of Oak Creek. Narrows in the upper part of the West Fork of Oak Creek. Underneath the one significant drop of Casner Cabin Draw.